The new way of “burning” books: 1, 2, 3, 4, 5. Now libraries just… throw them away by the thousands with the “economic cost” excuse. Our local library holds a yearly book sale to unload the piles in the bulging stacks. It’s a good fundraiser, but it takes an army of volunteers to run the darn sale. Most of the volunteers are women in their 60s and 70s. I wonder what will happen when they “retire”? These same women volunteer on the board, fundraise, and were behind the effort to get our new library built. The library is in the crosshairs of every city financial cut, even though it’s full of users every day. 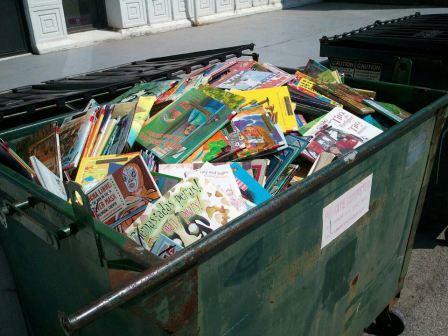 It’s a travesty to throw away books, but I don’t know if censorship is the problem — it’s more your last line: people are reading less, and are less willing to pay taxes to support libraries. Priorities are indeed shifting. Self-censorship? Indeed a difficult problem there. However I believe the state could really use such a free source of books! There are many people who really need them!